Working in a drone photography business usually commands a lifestyle that is a far cry from the usual 9-5 comfort zone – long days, plenty of travel, and random schedule mostly dependent on the weather are only a few “perks” to name. One of the biggest rewards is being able to discover many different places, exploring them in a way that only few humans get to, and hopefully coming back with a nice story to tell. While many jobs are enough of an experience themselves, the “bread and butter” work of most drone photographers are often very low on the adventure&excitement scale. To beat the fatigue of repetitive jobs, I always try to plan a visit to a nice flying location along the way, or at least use the trip to scout places I would consider flying in the future. This article offers a behind-the-scenes look at the process of creating one of my favorite videos captured with my DJI Phantom 4. 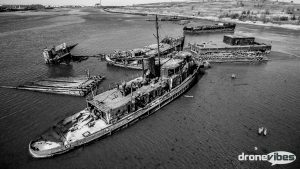 Haunting Drone View of an Abandoned Ship Graveyard in New York City – Arthur Kill Ship Graveyard, Staten Island, NYC Drone Video from NotAdrone on Vimeo. It all starts with a plan. 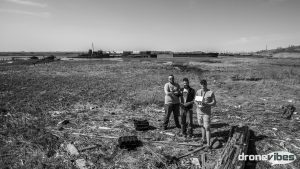 I learned about the Arthur Kill abandoned ship graveyard in Staten Island after seeing a video of it posted by a fellow droner on social media. I immediately researched the place and added it to the “must fly” list. I happen to have a construction progress job site about 30 minutes away from this place, so I asked my friends if they’d like to come with me to have some fun. It didn’t take much to convince a couple of them – Andy, a seasoned Phantom 3 pilot and eager aerial photography experimenter, and Micah, an aviation enthusiast, pilot, and proud owner of his first drone – Phantom 4. 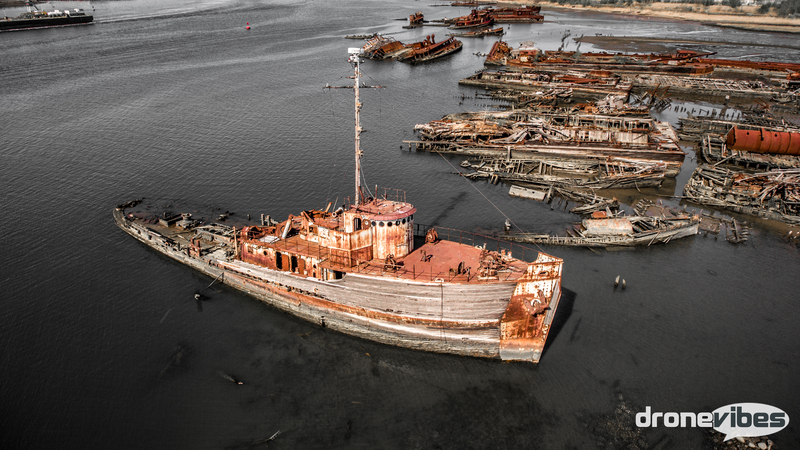 A ship graveyard is a great subject matter for aerial photography and video. Besides of a bit of a “water anxiety”, it is a fairly low risk environment, as one is only flying over water and a whole bunch of rusty hardware. We pulled up along the road near the river bank, walked a short path through some brush, and ended up in a wide open grassy marsh area. We were lucky to catch a low tide, and walk quite far away from the road and close to the ships. We broke out our drones, and quickly talked about “sharing the sky”. Flying multiple Phantoms in one location can be quite tricky as the drones and ground stations tend to heavily interfere with each other. Having the pilots away from each other is a must (we try to keep at least 30ft distance), however even bigger problem is when a Phantom gets too close to another pilot, or near the imaginary line between another Phantom and its pilot. This usually results in total disconnect of the app, for as long as the positioning is not changed, or the other Phantom is not turned off after landing. If left disconnected, the Phantom will still initiate the return to home command after a few seconds, so while uncomfortable, it is not usually a ruin – as long as the home point and return altitude are set correctly. Camera settings are very important to the final result. Phantom camera tends to over-sharpen things a bit, which may be great for stills, but not as great for video. In combination with the compression applied to the video being written on the memory card, it can create severe artifacting in uniformly textured areas, such as water, grass, etc. – turning them into jittery blobs in the image. To prevent that, I use custom camera settings to turn the sharpness down to -2 (the artifacting still appears with -1, and -3 is a bit too blurry, however you can always sharpen things up in post). While in there, I also turn down the saturation and contrast to -2, and set the color profile to d-log. Doing this gets me footage with great consistent color and exposure profile, making it much easier to grade it to my liking later. If you have never worked with the raw/log footage before, be aware that it will appear discolored, blurry, and very flat (milky), and it is not really useful without proper color grading and editing. I set my white balance manually to 6300K for (sunny day), and video format to 4K at 30fps. Since I’m recording in 4K, I needed to use class 10 micro-SD card – slower write speed cards may cause the frames to skip while recording in 4K. For still shots, I leave the sharpness, contrast, and saturation at 0, and shoot either in d-log or “normal” profile. On a bright day like this, an ND filter is a must. The ND filter limits the amount of light passing to the lens, allowing for slower shutter speeds for video. It helps to smooth out the video by introducing some motion blur to the individual frames by keeping the shutter speed at or near the ideal (roughly double your frame rate – so at 30fps, the ideal shutter speed would be 1/60 sec). Without it, the high shutter speeds on a bright day would cause the video to appear “jittery”, with visible steps between the frames. An ND16 would be ideal, I had to use an ND8 since my ND16 has not arrived yet. On the other hand, the ND8 still does a pretty good job slowing down the shutter speed, while still working well for the still shots without the need to land and remove the ND filter for stills – you can still easily get the 1/80-1/240 sec. shutter speeds on a sunny day, which is more than acceptable for blur-free stills. I used a few of my favorite “moves” in this video. Dolly Shot (opening shot, 0:04, 0:28) – a simple, slow moving, low to the ground shot. This shot works well to create interesting “parallax effect”, with the objects in foreground and close to the camera moving faster than the background. The key to this shot is having some interesting texture or objects close to the camera. In this video, you can see the dolly shot used in the opening shot (and a few more), where I used I used this technique to capture the rotten wood pier remnants sticking out of the mud, with the backdrop of the river and ships. The key is slow and steady speed, as the shots tend to pick up an “uneasy sensation” if the objects in foreground move too fast, and the viewers attention is drawn to the slow moving background instead. Zip-line&Tilt (00:11, 00:53, 1:17) – zip-line&tilt shot is usually executed by forward or diagonal motion at higher altitude, tilting the camera slightly to keep the subject relatively still in the shot, naturally drawing the viewers attention to it. This shot also works well with slight ascent (combined with slow tilt-down), or slight descent (combined with tilt-up). Zip-line shot works well moving forward as well as backwards – revealing the subject. Deep Tilt (0:15, transition shots) – simple, yet effective. This shot is executed by flying at constant speed, with the camera tilted dow at or close to 90 degrees, while letting the subjects enter and exit the frame. Efficient for creating a nice transitional shots and reveals. POI (0:58, 1:14) – a simple Point of Interest shot, executed by rotating around a set point at consistent altitude, speed, and distance. I prefer to fly the POI shots manually (two reasons – I learned flying drones before the intelligent flight modes became available, and I prefer to have more control over the framing and speed), but many flight controllers now offer a POI intelligent flight mode to help with that. The things to watch for with POI shots are the speed and keeping the horizon at reasonable level so the sky does not overwhelm the shot. POI Raise&Tilt (0:19, 1:05, 1:20, 1:32) – my favorite “twist” on POI-style shots, and perhaps my favorite shot overall. This shot is executed in the fashion similar to point of interest shots, with subject kept relatively in the middle of the screen (or, preferably in the thirds). Instead of rotating around the object at constant altitude and distance, I add a slow ascend, tilt the camera down, and move the drone above the subject, ending directly above the subject with the camera tilted all the way down. The stick movement requires some practice: throttle up, slight yaw/pan, slight roll in the opposite direction from yaw, and a little bit of pitch forward. All that while keeping my left index finger on the camera tilt wheel and tilting the camera slowly down. Little complex? Yes. Way cool? Definitely! I use Final Cut Pro X to edit my videos. 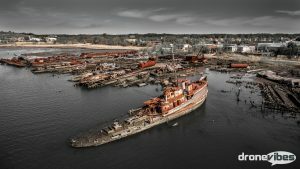 To make this video a bit more interesting, I used color mask layers to reduce the saturation of all colors except of red and orange, highlighting the rusty boat remnants, and giving the whole video a bit of a haunting feel. The color masking is done by adding a color correction video effect to the clip, and selecting a specific color mask, so the correction only applies to the selected color. Most of the shots required multiple color masks, one for each color I needed to de-saturate. This process takes a bit of time, but the outcome sure looks great and unusual. I spent quite a bit of time looking for an appropriate music track, as I believe that the audio part is just as important as the visual, and poor music track choice can ruin otherwise promising video. I needed something haunting, not overly epic, and fairly slow to match the speed of my clips. I use audiojungle.net to find and purchase licensed my music tracks, and I picked Haunting Dreams by Dejans, as this track perfectly matches the ambiance I was trying to create with this video. I begin my workflow by rolling through the footage, selecting all useful clips, and moving them to the timeline. This creates a good library of useful clips in one project. I them make a copy of this project (to keep one copy library intact, while cutting the video from the other one). It is important to me that the video flows well with the music, from the opening shot to the “finale”. I time the transitions to work with the beat and transitions in the music. This particular track gave me an opportunity to create unusual short transitional shots, quickly “flashing” in and out between the primary shots. It also has nice low and high parts to match the different shots (low vs. high, close vs. far). To give the video more cinematic feel, I used the “letterbox” effect to add black bars at the top and bottom to make shots appear wider. After exporting the video to Vimeo, I usually sit on it for a couple of days, watch it few times, and share it with my close friends to get their feedback. After that, I make my final adjustments, and the video is ready for the world to see. Connect&Comment: Please, leave your questions below, share your great work with us! Excellent pre and post Peter. Amazing what you can get out of a P4 with some skill and talent. Keep them coming and thanks for sharing the behind the scenes info. Thank you Paul, I appreciate it! Great video, just listened to the podcast and was nice to hear your talk through then see the end result. For POI Raise&Tilt Phantom 3 users should have a look at the vertical studio App, it allows Phantom3 to do visual tracking like the P4, and also has a nice wall feature where you can easily draw a boundary line (ie tree’s or a road) which it will not allow quad to go past, so you can then fly backwards/sideways shots confidently knowing you won’t bump into anything or overfly anywhere you shouldn’t !